GATHERING SPARKS is the graceful collision of Eve Goldberg, Jane Lewis, and Sam Turton—musical friends who bonded over finely tuned harmonies and the craft of songwriting. 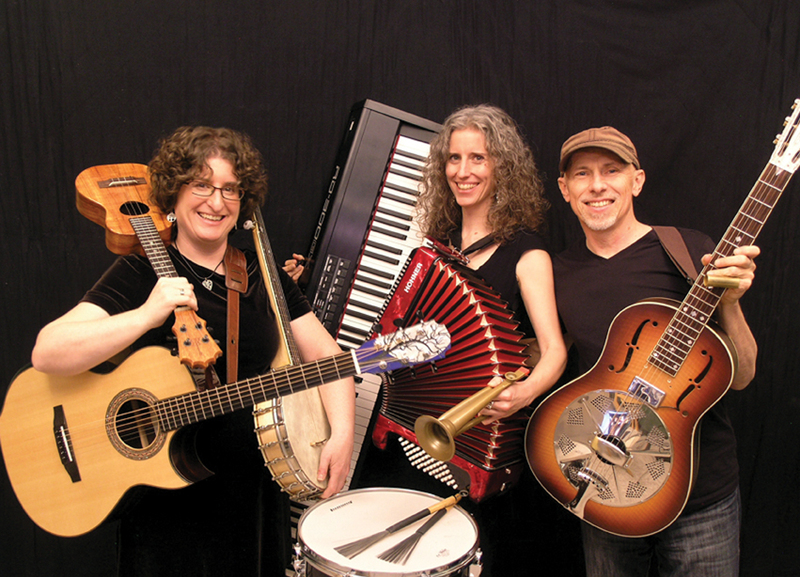 The trio’s inclusive approach embraces blues, gospel, folk, and pop influences tastefully played on acoustic and slide guitar, piano, accordion, ukulele, and banjo. With their love of participatory group singing and infectious mix of styles, Gathering Sparks is quickly making waves. Whether they are slaying an a capella ballad, busting out kazoos for a jazzy swing tune, getting down and low with the blues, or leading a well- known classic, Gathering Sparks performances pull their listeners in with their stellar harmonies and fine musicianship. SAM TURTON brings a powerful delivery, ringing slide guitar, and soulful groove to his songs of personal and social awareness. Inspired by delta blues and southern gospel, Sam’s passion is bringing people together in song. As solo performers, Eve, Jane, and Sam had each carved out their own niche in the folk/roots scene. But when they came together for a one-time triple bill in 2012, there was a certain “spark” that couldn’t be denied. The three loved the magic that came from the gathering of their songs, voices, instruments and styles, and a bona fide trio was born. In April 2014, Gathering Sparks released their first recording—a six-song CD that captures the rich harmonies and instrumentation of the trio’s live sound. Band members each take a turn at songwriting and singing lead on original songs in a variety of styles. Looking ahead, Gathering Sparks has a busy schedule through 2014 and into 2015, with appearances and workshops at summer festivals, music camps, concert series and house concerts. Check out their website at gatheringsparks.com for more information.